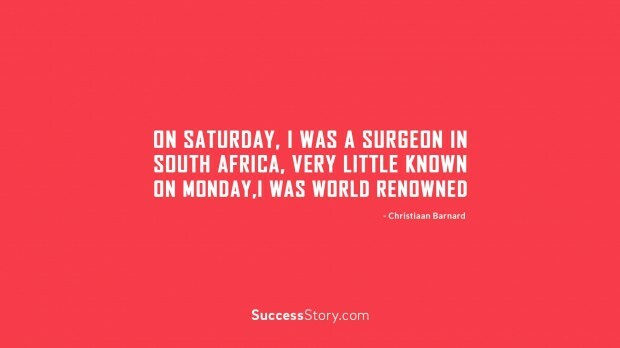 Christiaan Barnard was a medical surgeon who performed the first human to human heart transplant. Famous for his intelligent means , he was always respected for the manner in which he used to view life. His quotes have always been an example of how one could manoevre one’s attitude towards a positive side. According to Christiaan it is always better to try to live a better life than to never have tried at all. One cannot be negative or pessimistic about things and one always would have the best ways towards successful living and healthy attitude in this manner. "On Saturday, I was a surgeon in South Africa, very little known. On Monday, I was world renowned"
Christiaan impresses people with his capacity to make things seem easy on the healthfront and for all those who always had focus and concentration on their health there is this healthy attitude which would help them in staying mentally and physically healthy. Christiaan teaches people to have an introspection about everything and manages to convey his intentions with pun and irony. His quotes have a touch of pyschological reasoning which sets a person thinking always. His quotes are thus well received by the world. Christiaan Barnard has this habit of allowing a person to remain nonchalant about any serious ailment and according to him this is the only way one could make one’s way towards meeting up any health challenge in their life. Ideally one has to understand that any surgery would have its own impact and one has to take it in the stride.